Conex meta-aramid fibers are best known for their combination of strength and heat resistance. 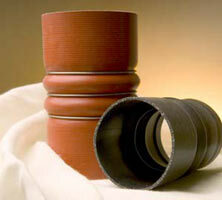 Warwick uses Conex fiber to enhance the performance of many of our products. Conex is resistant to temperatures of 100-250°C (212-482°F), depending on its application. Warwick Mills has used Conex fiber in multiple applications for rubber reinforcement fabric, which many companies have used to enhance and strengthen their hose and diaphragm construction. "Teijinconex is a meta-linked aromatic polyamide fiber known for its heat resistance. Teijinconex is a synthetic organic fiber comprised of polymetaphenylene isophthalic amide, which is formed by the reaction from meta-phenylenediamine and isophthaloyl chloride. Teijinconex does not melt in air, and offers excellent flame and combustion resistance. Teijinconex begins to decompose and carbonize at 400°C and has an LOI (Limiting Oxygen Index) of 30. It is a white, highly functional fiber that can be used from clothing to industrial materials."